This blog post is a response to the recent payday loan updates. I got wiped hard yesterday. Question: Is it the payday loan update or is it a temporary problem caused by Panda? This is a real question and I hope this question will reach the intended recipient. I hope you as a reader will find this post interesting and share it. If you have questions – please ask, cause I got answers for EVERYTHING. SmslånOnline.se is so unique in the business that it is just ridicilous it dropped. Not only do I focus 100% of giving nice and correct information, I work very transparently and am not hiding in the shadows. I want to make a typically spammy niche at least better. Compare SmslånOnline.se to any site in the business and you’ll se that it stands out tremendously. It has engagement and even natural links and is unique in it’s way of mixing usability, content and marketing in social media. Yes, I mean it. It has been ridiciously spammy (swedish) and you can see that I have been watching for more than a year. I am not saying I am the best man in the world – I am saying I have been the only one really trying to stick to Googles so called “guidelines” in Google sweden. My way of working, fully explained: http://simonnystrom.com/how-i-successfully-dominated-payday-loans-with-the-white-hat-on/ You should read this.You should actually check the functionality of SmslånOnline.se too. Compare it with any other affiliate site (+ add the fact that my prices are correct). How big is the drop we are talking about? 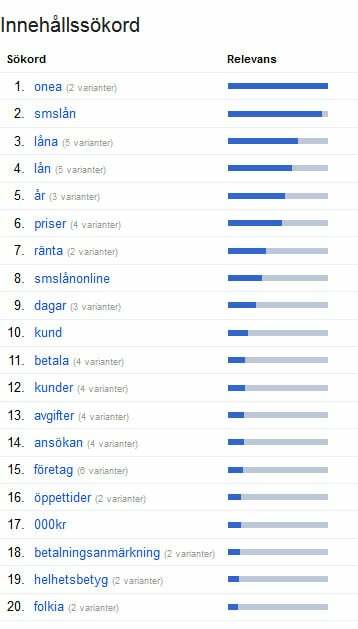 Below is my visibility for top generic keyword smslån (and variations) for my site SmslånOnline.se (blue) for about 12 months. You can see how I have been in the top, worked like crazy for a long time. The brown line represents a typical competitor who mostly build links and focus less on the rest. Rank fast – get the money – win? Notice the drop. This is for the top generics. Glitches can happen but this has happened to all my keywords, not only the big ones. Whaaaaat? This give me some hope. I actually have no unnatural links because: I am really not that link focused. The project was in fact a project to prove that spam can be beaten with real content and presence. I get links because people like what I do. The links are not that many but compared to the average site they are great just because they are from live sites, from real people, not from snapped dead bogus blogs that people use all the time. ( If you substract all the negative SEO links that is. More about them later in this article and I will even give you my disavow file to check. This niche doesn’t normally get any natural links but I have quite many of them. Even two brands link to me. SEO guys also links to me. You can say that these links are not good but if you ask me they are as fair as it gets. They are from real people and they link because they like what I do. It is the real intention with links. In fact, as natural links doesn’t really exist in this niche, the most natural thing that can actually happen is that guys interested in Internet marketing, with blogs, link to me and tell about the project. After all, they are the only ones Interested in the topic. There are no one else in the business getting natural links, they use networks (and use the quick method). Many sites break every single guideline and succeed. I try to follow every guideline. I am the one getting wiped? Come on?! Notice the import of my project blog? Even thoug it is a summary of my posts this was probably not a good idea because of duplicated content. I have deleted everything. “not worth it” I would say. Comment: I have everything verified in Webmaster Tools – Google should understand it is my content..? 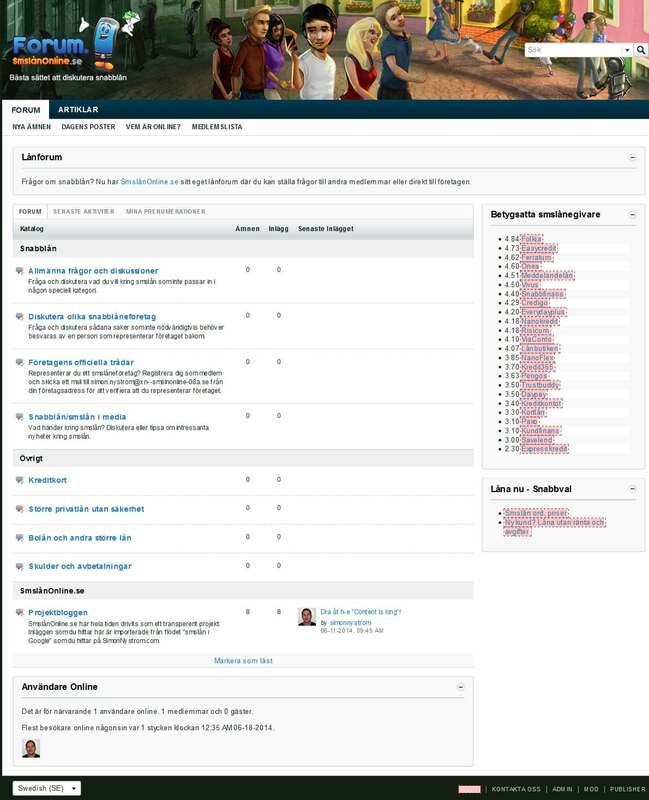 More important: I have a nice admin to manage my site programmed with all functionality I need. I programmed it. When you check a review you always get information about the payday loan company that gives the best ordinary price, with a link to that review. Lately one of the payday loan companies (Onea) made changes and offered much better ordinary prices than everybody else. 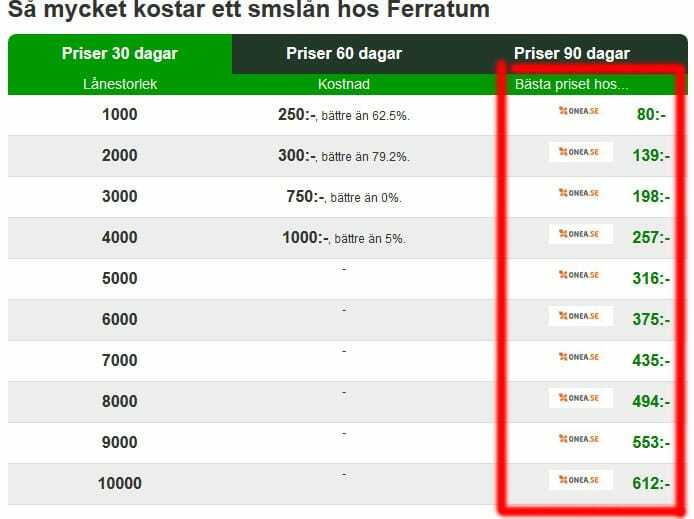 In fact it has the best ordinary price for all loans below 10 000 SEK. This means this brand recieved image links from all review pages to their own review page. I actually gave it some thought first and took a loan myself to see if they were bull******** people but they were not. I also thought about the possible problems this could cause but I was quite confident in the trust of the site and thought that Google at worst would make a manual check and realize it was fair. I guess I was wrong here.The problem explained (best price links): Text version (there are 3 tabs which will make the problem even more severe): As Onea.se has the best ordinary prices they suddenly recieved links from all pages. 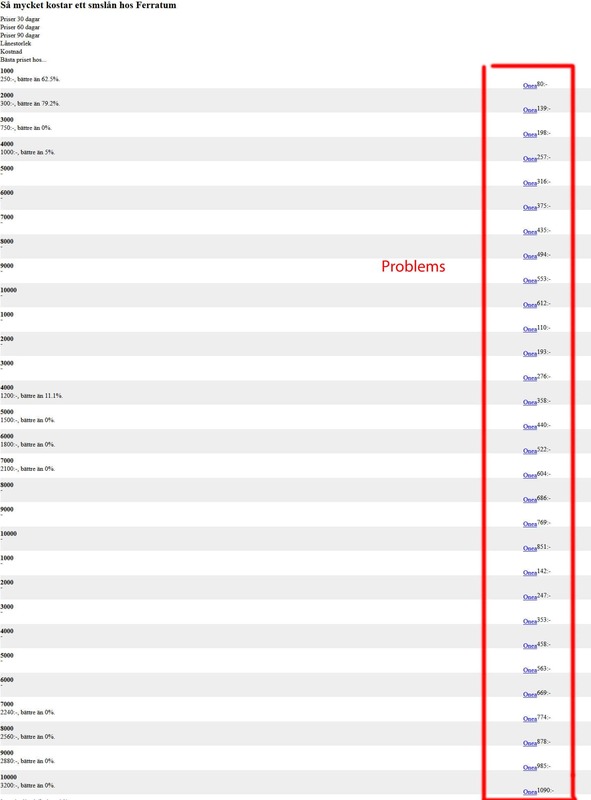 I can agree that all in all these are big problems, but are they big enough to destroy the whole site? For me this is Panda related stuff and hopefully I come back when I cleaned it. (“In a perfect world, doh”). Do you know how long it can take? Matt Cutts, I need some help here please. You can say that this is a beginner’s mistake. Problem is that the “best price” function is very good for the user but Google probably don’t like it. Cheers for that! I have removed it until I come up with a solution. If this really is the payday loan update algorithm I have a reason to freak out – and you too. I have done my fair part for the payday loan business. I have spent 1,5 years giving “smslånonline” trust and credibility. I made it a brand more than other sites and of course I have ranked for this query and simlar queries all the time. I have seen it as an impossibility to drop for this keyword as I am working with visitor satisfaction, not spam. My site was strong, and had age. Competitors know about my site this and have lately been spamming quite hard with names that are similar to Smslånonline.se to get free traffic from things I created. 2. And now when I do a search for “smslånonline” which I always have ranked for. My site is at position #40! Let’s have a look at the “top domain” with the Loan Snake (my program that tries to summarize spam networks). It is easy to spot that this is just another mass produced thin site, but still I am the one to drop completely even though I have worked with my brand crazy much? Something is terribly wrong here if this is the payday loan update! 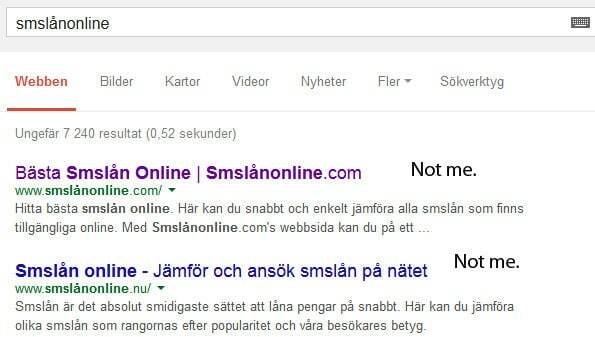 A bunch of spam sites are now ranking before me for smslånonline, smslanonline, smslån-online, smslan-online and anything you can come up with that would usually be a search made to find my site. I actually caught and proved one guy doing this (Swedish). Too bad it just resulted in even more attacks from the spammers. Great teamwork…I have 4000 domains in my disavow file and have to update it frequently. See the disavow file here. Yesterday I wrote a guest post (without links) in one of Sweden’s biggest SEO blogs. I didn’t actually put any links in the post, much because I think the “link thinking” is much exaggerated and that marketing in itself is very powerful if you have a good site. I am not a link hunter and that post is kind of proof of that. And I am still the one that got bashed? Should I laugh or cry when I gave this post the name “How to predict monthly traffic changes” and my site got wiped the same day? Dear Mr Cutts, if this is the payday algorithm in “working mode”, plese tell me how this update (or what it is) improved the quality of the search results? I don’t want to be rude even though I am quite upset right now. After all – it can be my own fault and that it is just a temporary filter because of the onpage changes made. I have cleaned everything up now. I would really appreciate your answer here. To you other guys – please share!